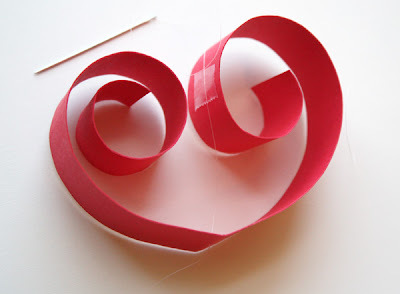 A simple DIY Valentine's Day paper project: hearts on a string. Cut colored paper into 3/4" strips. Fold them in half, or if you want some hearts that are twice as big, splice two strips of paper together at the bottom of each heart with double stick tape. Curl the loose ends around a chopstick or pen. String the heart garland together from the bottom up. I used Sulky clear thread, available at fabric stores. It's curly and hard to see so you have to fight with it a bit, but it turns out nearly invisible. Push your threaded needle up through the bottom fold of each heart, then use double stick tape to sandwich the thread between the two halves of the curled tops. So sweet and simple. I'd find a reason to leave them up long past Valentine's day. I can't wait to do this project with my 7-year old tonight! Thank you! so cute and so simple! Love it!!! Cute! I totally want to do this if I ahve some extra time! such a wonderfully simple little thing! thank you so much for sharing, i do adore your blog. It works that the kids and I are all home sick today. Thanks for all you do here. SO fun! I love this! I made one for my house in 20 minutes, but with a twist: instead of hanging them vertically I sewed them horizontally together. I had to pass through the curls of the heart near the top, but the end result looks really cute. The hearts are right up next to each other on the string. Thanks for a great idea! New reader to your blog...loving every day so far! Oh this is SO cute! You get hearts without having to cut out hearts! Loving the idea. Would you mind if I show off this item in an upcoming Valentine's post at my blog? I will of course credit you with the idea and link back to your post! Let me know if this is not ok please. And be sure to check out the post at simplydesigning.blogspot.com and while you are there, feel free to grab an "I've been featured at" button. Thanks for the fabulous ideas! maybe I'll use this in a friend's wedding! simple and romantic! love it. hope it's ok i advertised your blog & this project in my blog today. Love this great idea, will definitely be making this with my boys! And would love to post about it on my blog crediting you of course. Will that be ok? I LOVE simple and easy idea. This is awesome. I have some magazines in the recycling bin that will work great for this!! You earn $1.00 for every free sign up as publisher generated by you! With our 3-tier commission structure, you will also leverage your income through other affiliates' efforts. WE GUARANTEED! Selling nothing and just introduce other affiliate to sign up Mobile Publisher Affiliate Program for free. i love hearts. i love spirals. i love garlands. adding this to my valentine's day super-cute-stuff-to-make list. sweet and simple! love it! Thanks so much for this,I am going to make some of these for my house now! This is so cute. I love the rolled paper idea. I also love your blog, good job. Very cute - we've got to try it! They remind me of your bog header, too...try it with leaves? This is awesome and simple! I think even I can do it. I put a link on my blog http://www.collectivelygenius.com/ for all to see! Wow it's very beautiful ideas!!! Many ciao from Italy!!! sweet! what a great valentine's day project for school! We (my 7 year old and I) made a few of these today - so cute and easy! Thanks. I think I need to expand my Valentine's celebrating to decorating! this sure brightened my day...thanks! thanks for another funky tutorial!!! oh lovely, lovely, lovely!!! my brother's getting married and we DIYed a lot to save cost and because it's a LOT of FUN! Your site has given me abundance of ideas for the wedding. These are so pretty! A friend of mine recently showed me the art of quilling, which it looks like this is in the family of. So much you can do with it for every occasion! Her project is here http://yaydiy.com/2009/12/quill-out/ but I'm going to show her this one too so we can make these too! I really loved this idea and made minis to sent snail mail to my far away friends. Once I got started making the hearts they took on a life of their own. These are beautiful! I love their simplicity. I'm going to show them to the kids I teach; I know they'd love to make some. Thank you! these are soooooo cute! I will have to try making these for the group home I work at. LOVELY! Had to blog about it! Thanks so much for a great blog! as others have said, so simple and so very sweet! thanks a lot for this! These are very cute. I made a string of the paper ornaments from a few weeks back as well, and now I am perplexed about how to affix them to the wall/ceiling. I love garlands, but tape looks a bit sloppy for something I would keep up beyond the holidays. Anybody have suggestions? These are so adorable, I can't wait to try making these with my little three year old. I totally think we can conquer this together! These are so cool ~ We will have fun making these! love this, thanks so much for posting!! My daughter and I made a bunch last night. So fun! Thanks for the tutorial! what a simply lovely idea ... i was taken on first glance, thanks to deidra at jumping tandem! Just wanted to add a tip. Make a few extra hearts and hang them on the edge of the glass for your valentines dinner. Makes a nice decoration, and if you are having a dinnerparty you can write the guests names on the hearts as well. Love the blog! 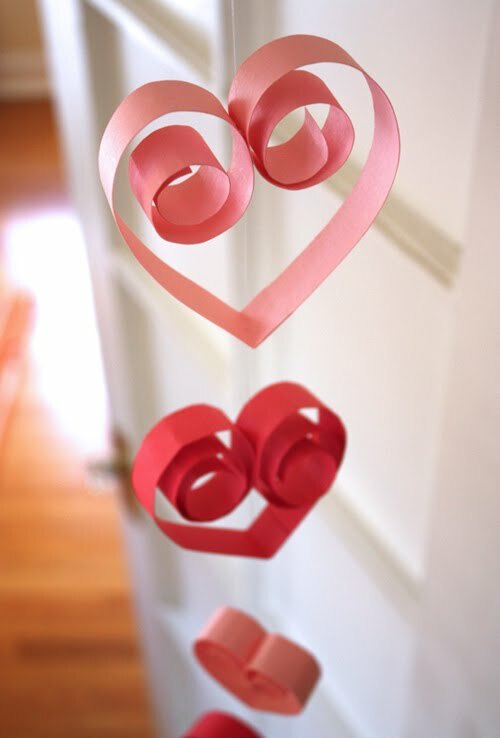 I love this heart garland! I'm going to try it at the assisted living residence where I work. I think the residents will love making it! Thank you! Thanks for the idea! I'll be sure to credit you! Love this! Brings back memories of grade school when I think we did something similar to this. Thanks for sharing. GORGEOUS. And the fact that it can be easily done makes it more enticing. oh lovely!!! A friend of mine recently showed me the art of quelling, which it looks like this is in the family of. So much you can do with it for every occasion! This is simply adorable, I love it! Wow! These are going to make a gloomy day fun. Thanks for all of your inspiration. These are so sweet and fab! I made them last night, but sideways (instead of vertical), which worked well, too. After work I'm going to whip up a garland of the fabric book hearts garland to go with it. Also, as a How About Orange newbie, I should say: this blog is great! Love the photography and the ideas. You've been bookmarked for sure. :) Thanks for the inspiration! This i will try, amazing and cute. Et ben moi je dit bravo!!!! Love these adorable little hearts!! Just posted about them on Craft Gossip!! Yours are cute! Nice work. Thanks for the great idea! I love the way this looks and the fact that it would look cute even if it were made by children!! Love it so much I'm featuring it on my blog this week: little-inspirations.blogspot.com Thanks for the inspiration! This is so simple! thx!